Florijn Twee on rubber strap. 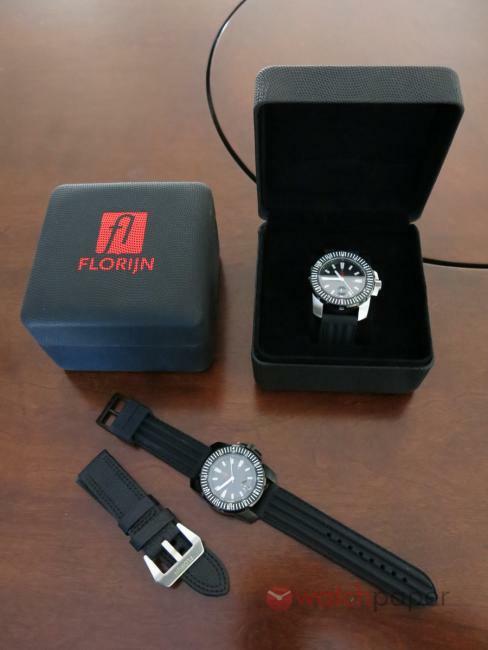 We reported earlier about the launch of a new Dutch watch brand, Florijn watches. Their debut collection includes three rather massive models, powered by Seiko NH 35 automatic calibre. Thanks to Hans Heuvelman, the founder of Florijn, I’m bringing you today the twin review of Florijn Twee (Dutch for two) and Drie (three). With Florijn, Hans had the vision of a watch brand that would be grounded in the tradition of Dutch design, a tribute to all the good things the Netherlands has to offer: the landscape, the architecture, and most importantly its people known for their tolerance, salesmanship and conviviality. Let’s see, how these watches reflect his source of inspiration. Florijn pieces come in a beautiful black presentation box with the red fl (Florijn) logo on the top. 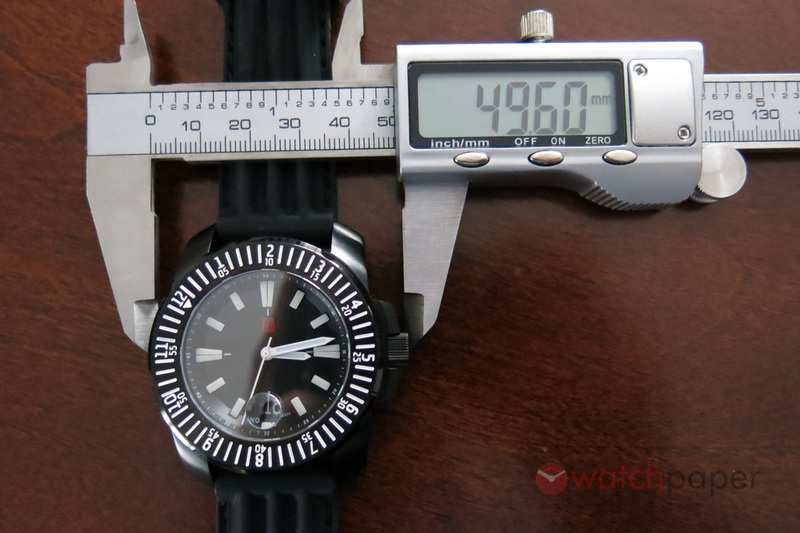 As soon as opened the box and especially once I had the watch in my hands, I could tell this is a big toy, probably too big for my wrist. Everything screams solid, sturdy and bold about this piece. Its size, the sheer weight and the proportions allude to a daring and straightforward nature. 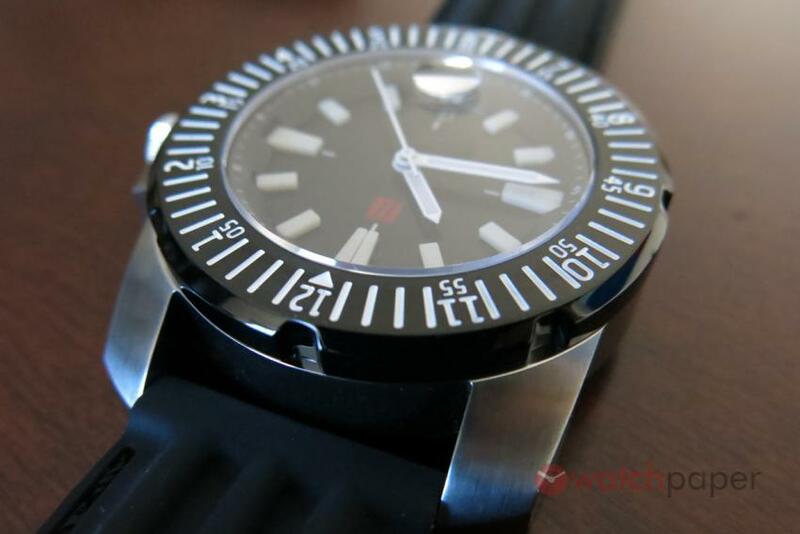 We are used to see microbrands relying on Miyota 9015, but Florijn preferred using a Seiko NH 35, an automatic calibre with 40 hours of power reserve and with a hacking functionality. The main difference between the two models is that the Florijn Drie case is fully coated width black DLC, while the Twee is stainless steel with the black DLC covering only the bezel. With a diameter of 45 mm, at least on paper, you might be under the impression that this is not a very big watch. Once we take in consideration the lug to lug length of 53 mm and its width of close to 50 mm with the crown, we have a clearer image about the proportion of these pieces. Straight lines, sharp corners and very few rounded details; they all make the Florijn a particularly masculine tool piece. The stainless steel surfaces bear the marks of brushed finishing, a subtle texture of straight lines that further emphasize the cubist geometry of the watch. On the right side, between two crown protectors lies the screw-down crown with its polished tip featuring the Florijn logo. The crown is easy to handle, giving a reliable feeling and when fully pulled out, the Seiko movement will stop the seconds hand for a more accurate time adjusting. 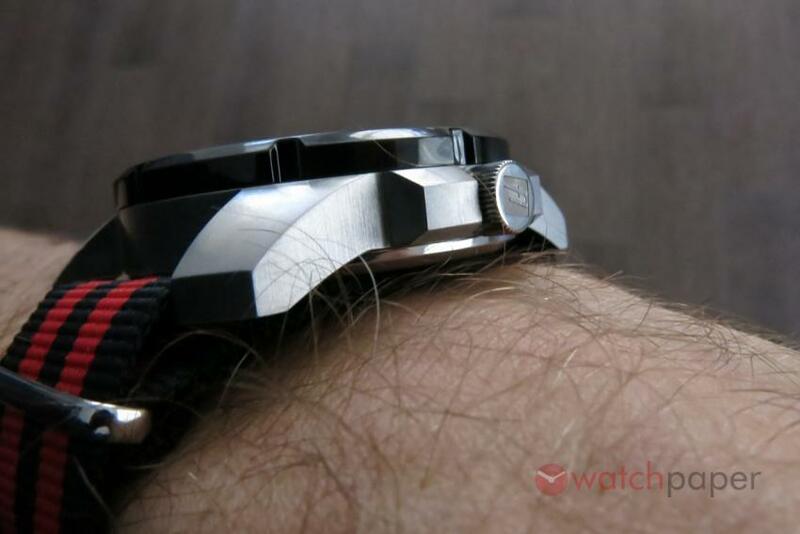 I am particularly impressed by screw-down back of the watch. 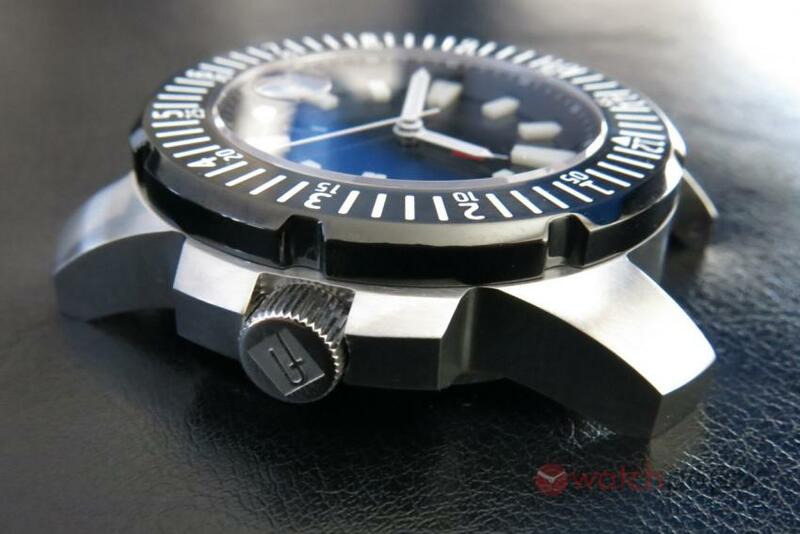 The polished stainless steel is decorated with the Florijn logo surrounded by an engraving in Dutch: FLORIJN ROESTVRIJ STAAL – MECHANISCH UURWERK; SAFFIERGLAS – 300 METER WATERDICHT (Florijn Stainless Steel – Mechanical watch; Sapphire Crystal – 300 m water resistance). What makes this interesting, to see and to touch, is the fact that it is done with negative engraving, leaving the text and the logo polished inside the matt surface. 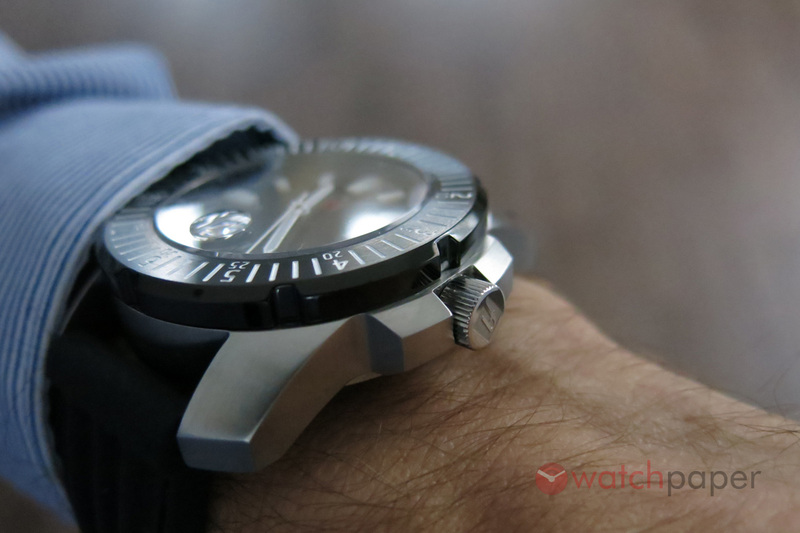 The unidirectional 120 click rotating bezel, on both models, is DLC coated with matt, circular brushed surface on the top and polished on the side. To be honest, the polished finish of the side of the bezel surprises me; it doesn’t makes the bezel easier to rotate and aesthetically creates an unexpected contrast with all the other brushed surfaces. 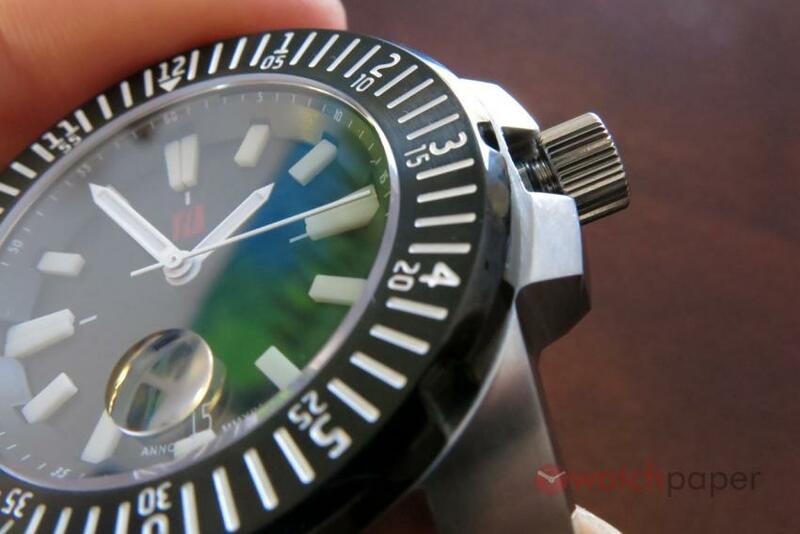 The bezel features white numerals for hours and underneath them smaller digits for minutes. The black and white contrast is great, offering good readability in most of the situations. 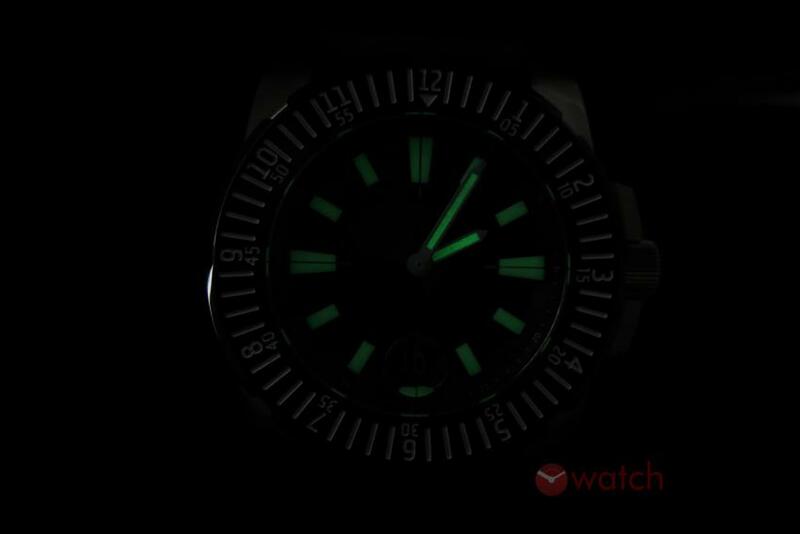 I would have loved to see lume on the bezel, if not on every line and number, at least on the triangle at 12. It can still be a practical tool for keeping up with a second time zone. The dial sits under a flat sapphire crystal that was treated with double anti-reflective coating. 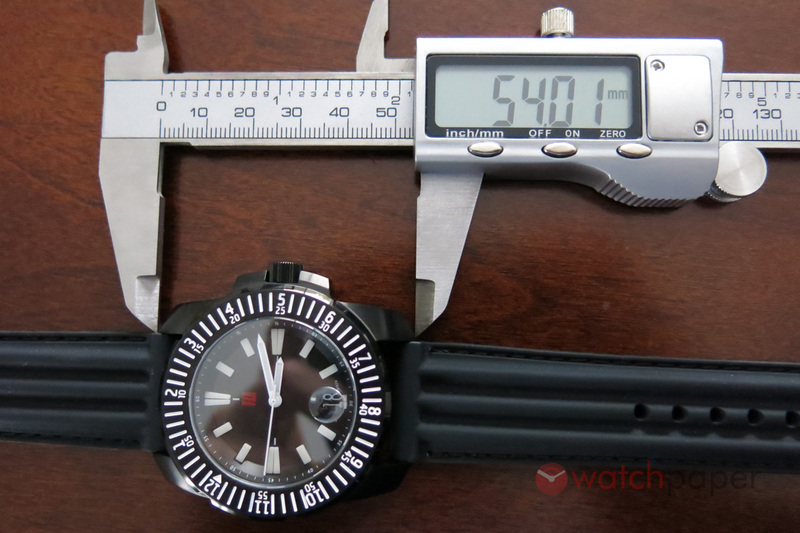 The loupe over the date window at 6 o’clock won’t escape the attention. It is applied on the exterior of the crystal, creating a little bump on its flat surface. As we go lower, under the crystal, well find a black chapter ring that was cut to have two visible surfaces, a thin ring at a mild angle on the top with tiny numeral and minutes marks finely printed in white and steeper angle that goes all the way to the bottom of the dial. At every five minutes large white indexes coated with luminous paint come out from the chapter ring. They are accompanied by Roman sword shaped white hands for minutes and hours that are also coated with lume. 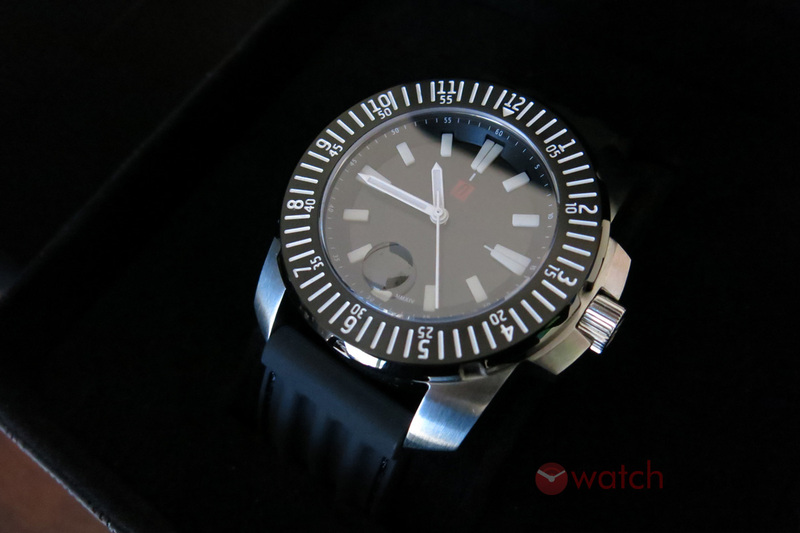 The high contrast of the white with the matt black surface of the dial offers an excellent readability. There is a little red fl logo at 12 o’clock and a date window at 6. With tiny letters, next to the date is printed ANNO MMXIV, the year Florijn was founded. 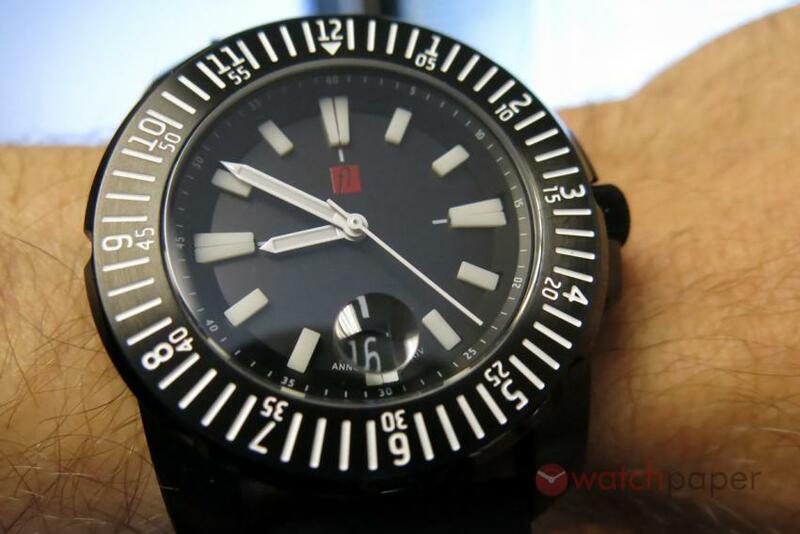 Usually watch dials would have AUTOMATIC printed somewhere, just to show that it’s not quartz, but not the Florijn. The dial is very practical, with no non-sense decorations; everything is geared towards function, a feature that plays well with the rest of the design of this piece. Florijn Twee on leather and Drie on rubber. 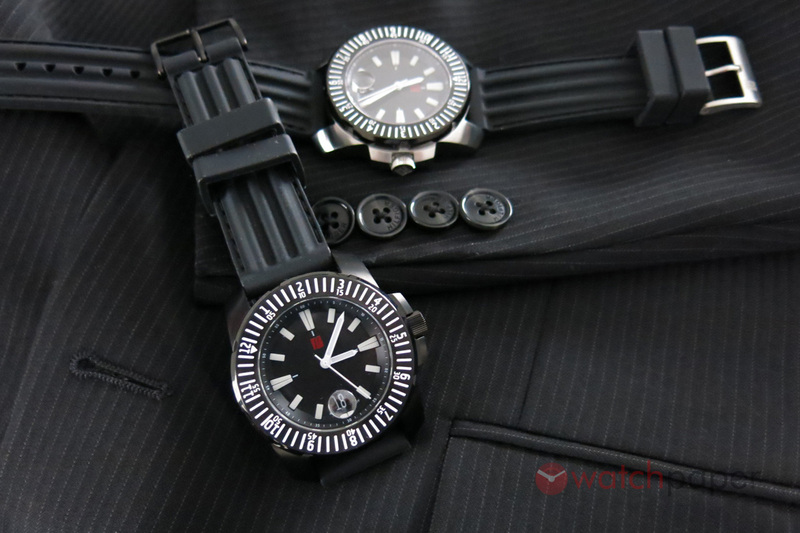 If you like swapping straps, you’ll have a lot of fun with the Florijn as it comes with three straps. 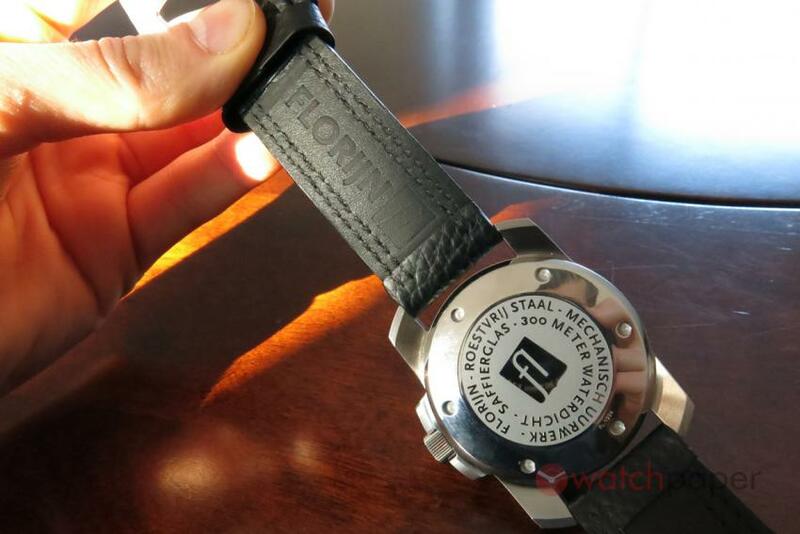 First of all, you have a thick black rubber strap, with black stitches all around and a branded buckle. 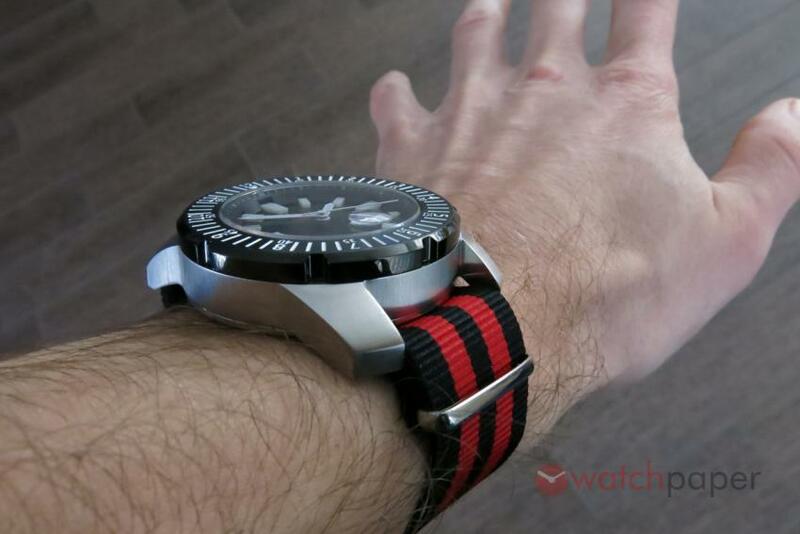 Secondly, there is a black leather strap with two rows of black stitching; again it’s a really thick strap – somewhere between 4 to 5 mm – that goes well with the hefty proportions of the watch. 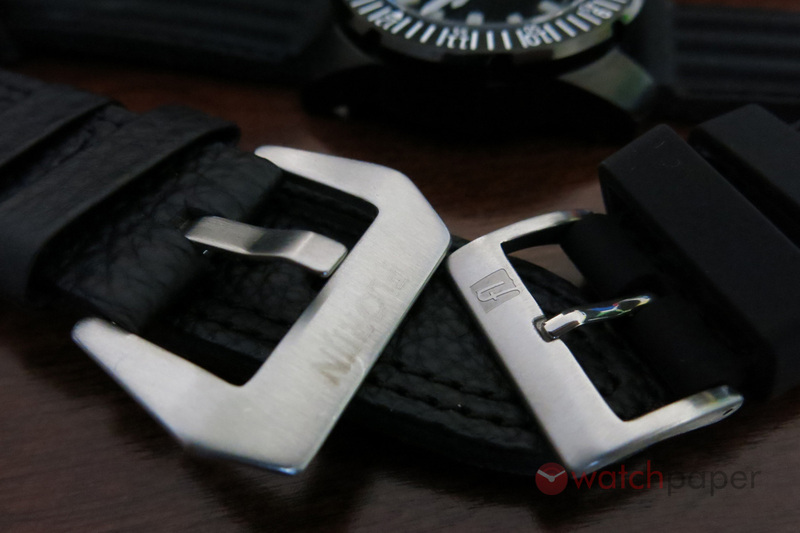 The branded buckle on the leather strap, reminds me the buckles used by Panerai. Since we’re talking buckles, I should mention that the Florijn Drie will have black DLC on its buckles too. Last, but not least is the black and red NATO strap that in my case proved to be the most comfortable to wear. 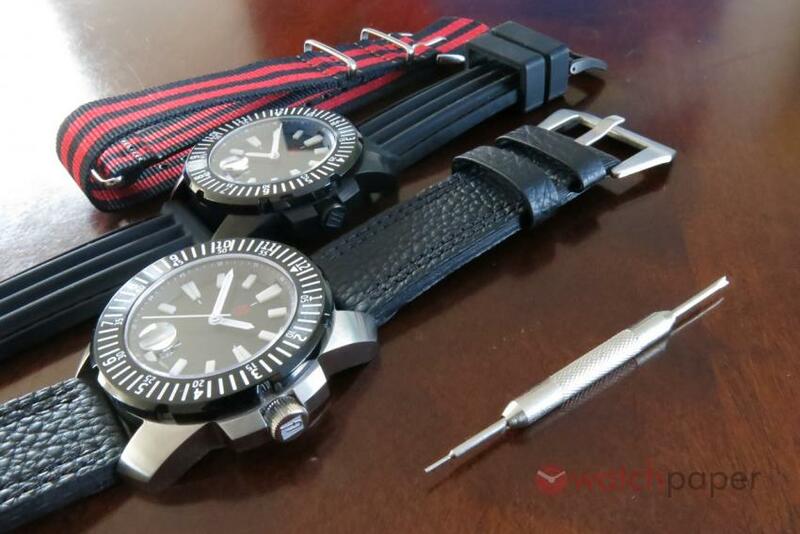 I don’t have to tell you, once you put on a different strap, it’s like having a different watch and to make it easy, every Florijn will come with a little strap changing tool. 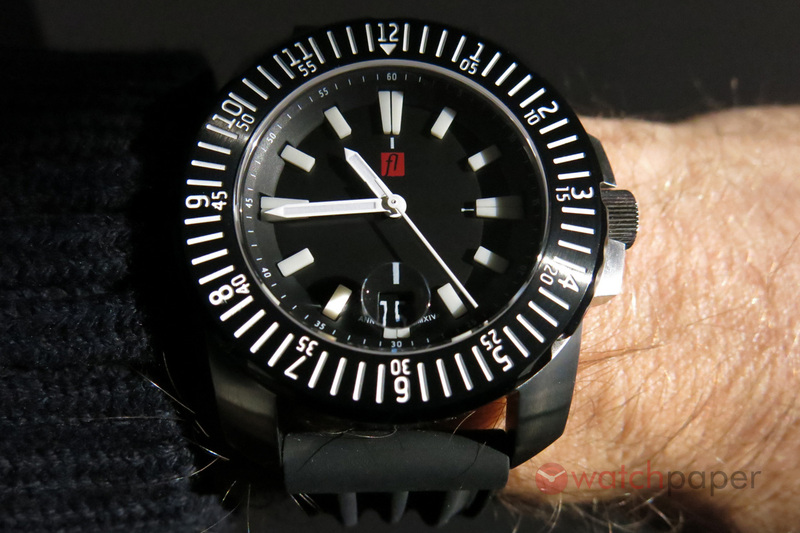 The Florijn is one of those watches that won’t pass unobserved. 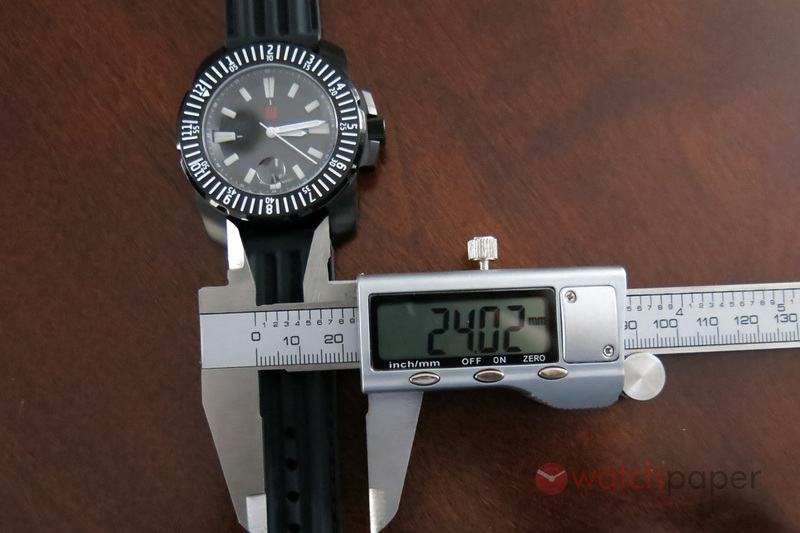 It’s a very polarizing watch, the kind of piece that some people will love unconditionally and others will hate no matter what. As a personal advice, if you are the skinny type like me, you better look for a different piece. 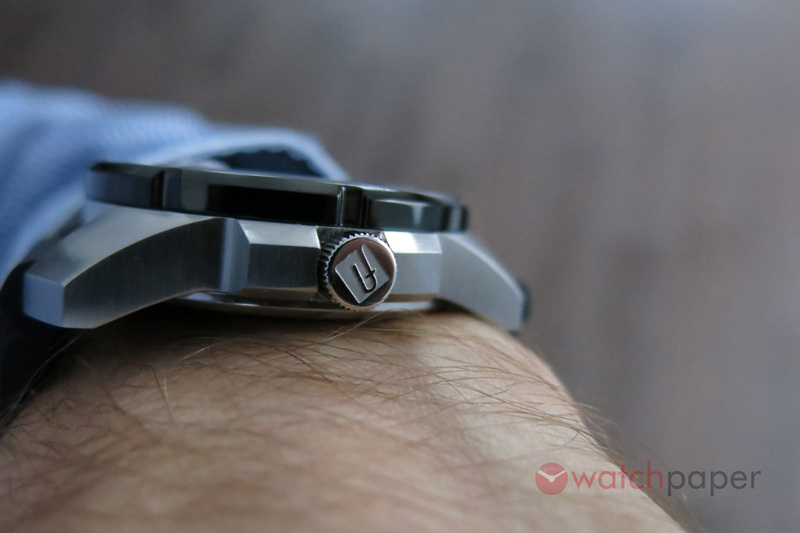 Its large proportions and sharp corners were designed for people with a hefty wrist. This is a tool watch; the kind of piece I would not be afraid to bang around, wearing it gives the same piece of mind as an armoured vehicle. Florijn is a great example of the Dutch spirit, every corner of it is a testimony of boldness, courage and honesty. There is only one thing I would suggest Florijn for their upcoming models, they should introduce an element of fun, a bit of wackiness, of humor that is so characteristic of Dutch design and culture in general. Saying that, this is a great debut collection and I’m looking forward to what will follow. While I did not have the chance to see the Florijn Eins, which is all stainless steel, you should check it out; there are many things to like about it. For our Q&A with Hans Heuvelman click here. Florijn Twee in its box. 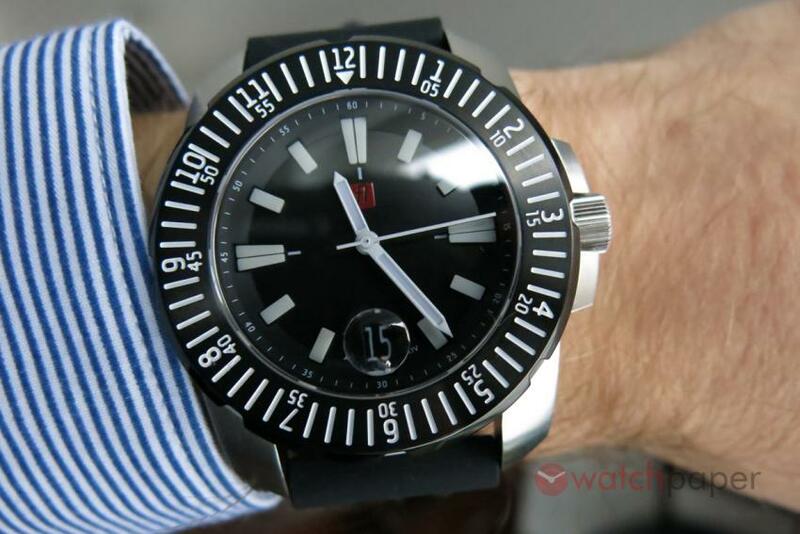 The Florijn looks great on NATO.